LMF series benchtop muffle furnaces feature a 550 cubic inch chamber with fiber insulation and firebrick heating plates. 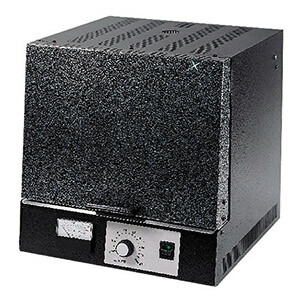 The furnace cabinet is constructed of 16-gage steel with a baked epoxy finish. A top exhaust port allows gases to be vented, or it can be plugged during operation to seal the opening. Two temperature controller models are available: automatic and multi-stage programmable. LMF series furnaces are ideal for heat treating applications, material research and sample ashing determinations in the geological, metalurgical, and wastewater treatment industries. These furnaces are also used in chemistry, physics, and engineering laboratories. Model LMF-A550 has an analog pyrometer which displays temperature, scaled in 50° increments. Temperature is adjusted via a large control dial, scaled in 100° increments. The controller repeatability is excellent. Model LMF-3550 has a 3-stage programmable temperature controller which stores up to 10 programs in memory. Any two programs can be linked to create a single six-stage program. One program is dedicated to a single set point that holds the setpoint indefinitely. The delay cycle allows the furnace to be set to its heating cycle at a specific time on a future date. The PID controller allows heat increase or decrease rates to be programmed into the cycle. 참고: Includes ceramic floor tray, power cord and complete operator’s manual.